OTET Question Paper- Are you searching for OTET question paper pdf then you are in the right place Here you will get OTET previous year question paper with answer pdf. You can also check out OTET question paper 2017 and OTET question paper 2016 with answer pdf. It is not difficult to get OTET previous year question paper but you need to check out this post. What is the OTET examination? OTET stands for Odisha Teacher Eligibility Test. It is an exam based on teaching jobs. 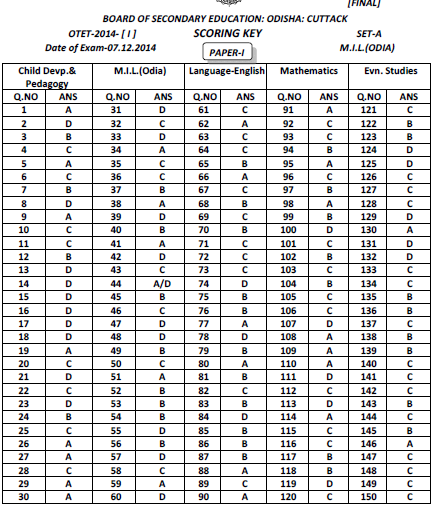 OTET test conducted by BSE Odisha (Board of Secondary Education Odisha). Every year BSE Odisha conducted OTET test in order to take aspirant students in the field of teaching. If students are able to crack OTET test then he/she will be given jobs to teach a primary class in government as well as aided schools in Odisha. 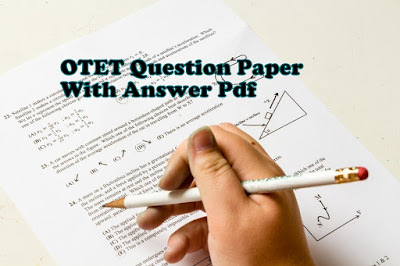 OTET exam 2019- It is easy to get OTET previous year question paper with answer. You can download OTET question paper with answer. People still searching for 'How do I get OTET previous year question paper for free? Today I will give you OTET question paper with answer 2017. The students need to practice some previous year question paper in order to understand the question pattern and questions. I would suggest you go through this question paper and answer them for yourself. Collect some previous year question paper and read for yourself and try to understand the tricks behind this question. Make a note while reading which topic is important or not. I would suggest you buy some OTET entrance guide and make sure to finish the book before going to take the entrance test. The student needs to read some important books related to OTET entrance test like History of Odisha, English grammar, Pedagogy, etc.